Wisconsin Oven Corporation manufactured a custom electrically heated enhanced duty walk-in oven for an aerospace parts manufacturer. The industrial oven will be used for curing composites. “At Wisconsin Oven, we pride ourselves on exceeding customer expectations. In this case, our innovative design team did a great job coming up with a solution to increasing the length of the oven without a complete re-design of the original oven." Wisconsin Oven Corporation manufactured a custom electrically heated enhanced duty walk-in oven for an aerospace parts manufacturer. The industrial oven will be used for curing composites. The customer originally purchased one curing oven and prior to the completion of the order, they realized the need to process larger parts. Wisconsin Oven was able to customize the original oven by building a second oven onto it with a vertical lift door between them. The innovative design not only increased the original length of the composite curing oven to allow for processing of larger parts, it also provides the customer with the ability to run the ovens independently to accommodate a range of product sizes. 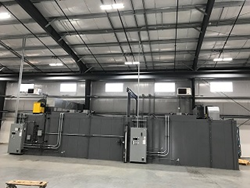 The maximum operating temperature of this composite curing oven is 500°F and the total work chamber dimensions are 10’0” W x 42’0” L X 6’0” H. This walk-in oven is designed with the capability to heat 1,000 pounds of steel and 200 pounds of a composite material from 70° to 270°F at 5°F per minute. The recirculation system features combination airflow which maximizes heating rates and temperature uniformity. Guaranteed temperature uniformity of ±10°F at 270F was documented with a standard fifteen (15) point profile test conducted in an empty oven chamber under static operating conditions. This walk-in oven was fully factory tested and adjusted prior to shipment from our facility. All safety interlocks are checked for proper operation and the equipment is operated at the normal and maximum operating temperatures. An extensive quality assurance checklist was completed to ensure the equipment met all Wisconsin Oven quality standards. This equipment is backed by Wisconsin Oven’s Exclusive and Unprecedented 5-Year WOW™ warranty (parts only). Wisconsin Oven Corporation has been designing, engineering, and manufacturing industrial ovens and other heating equipment since 1973. Their custom and standard industrial ovens are used for a multitude of applications including heat treating, finishing, drying, and curing. Many of the industries they serve require specific temperature uniformity and equipment performance documentation. Their experienced design team is able to meet even the most stringent standards for their customers’ equipment. Wisconsin Oven realizes that the success of the company depends on their Championship team of employees, which is why they have developed a company culture that recognizes and rewards employees. The goal at Wisconsin Oven is to outperform competition and provide customers with outstanding products and service. Wisconsin Oven is owned by Thermal Product Solutions (“TPS”), a leading American manufacturer of industrial ovens, furnaces, pharmaceutical sterilizers, laboratory ovens, environmental temperature chambers, and stability test chambers. TPS provides thermal processing and test solutions for a range of industries. TPS brands include Baker Furnace, Blue M, Gruenberg, Tenney, Lindberg, Lunaire, MPH, and Wisconsin Oven. For more information on equipment solutions from TPS visit the website at http://www.thermalproductsolutions.com.